A chestnut mare grazes in a field in this typical New England scene. So often, I drive by scenes like this in my daily travels. 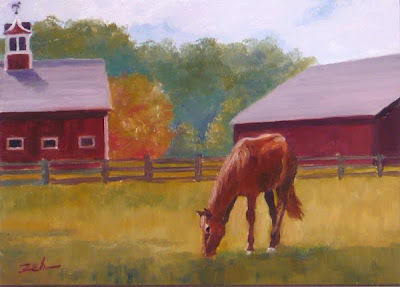 Such peaceful scenes really catch my eye and make great subjects for paintings. This painting has been sold. To see more of my art for sale, please visit zehoriginalart.com. Thanks and have a great day!